Last year, the notoriously stodgy Foreign Language branch of the Academy failed to nominate Marjane Satrapi's marvelous animated French film Persepolis, leaving it instead for a single nomination in the Best Animated Feature category. 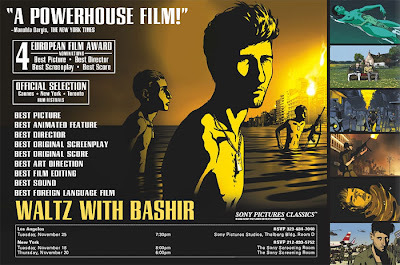 This year, they have another animated foreign film on their hands in the form of Israel's Waltz with Bashir, a film that should technically be eligible for Best Documentary as well (how many foreign, animated documentaries do you see? ), but isn't due to a technicality. It is a film that easily belongs in the company of the year's very best, but I have a sneaking suspicion that the Academy will overlook it in the Foreign category in favor or more traditional fare. War films usually do well in this category, but will they be able to stomach one that is so experimental and so unflinching? This category has always been problematic, with the voters tending to play it safe with standard, schmaltzy films instead of darker, grittier films like 4 Months, 3 Weeks, and 2 Days (which was notoriously snubbed last year). I'm not going to hold my breath, but hopefully Waltz with Bashir will gather enough heat through the next month that they won't be able to ignore it. When is the foreign language branch going to realize that animation isn't just for kids? Yes, this situation is infuriating. One wonders if this injustice will ever be rectified.